Official synopsis: "Grace is fascinated by the wolves in the woods behind her house; one yellow-eyed wolf in particular. Every winter, she watches him but every summer, he disappears. Sam leads two lives. In winter he stays in the frozen woods, with the protection of the pack.n summer, he has a few precious months to be human . . . until the cold makes him shift back again. When Grace and Sam finally meet they realize they can't bear to be apart. But as winter nears, Sam must fight to stay human - or risk losing himself, and Grace, for ever." 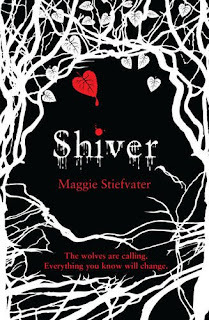 Shiver is the first book in The Wolves of Mercy Falls trilogy by Maggie Stiefvater is and is the embodiment of brilliance! A pack of wolves is living in Minnesota, and when Jack Culpepper is killed, the town goes into a state of suspicion and fear. But Grace knows that her wolf - the yellow-eyed dark wolf - couldn't have had anything to do with it. She can feel it. He can't have done. But when a boy turns up on her doorstep injured, she knows that he and the wolf she has obsessed over for years are the same. Enter Sam. A charming young man who has a secret. He's a werewolf. But there are some major differences to the werewolf that we all know (turns only at the full moon and is killed by silver bullets). Instead, he will only turn into his wolf form when it is terribly cold. And with winter approaching, and what looks like being his last year being able to turn into a human (yes - it's limited!) he wants to make the most of it. The most of his time with Grace. I have to say that my favourite character is Sam. I really related to him (probably with me being a guy too). His emotions that he feels. The things he thinks about. I really liked the way that he conveys some of his feelings through lyrics and poetry. It shows that he's more than a character - he's obviously been created masterfully. I hope that we get to see more and more of him throughout the trilogy. I generally found the parts written from his perspective easier to read. That's not to say that I don't like Grace. But I don't connect with her as much. She's a more self-serving character. She's so independent that she finds it hard to let others in to help her - and she's so calm in a crisis - something I myself cannot claim. I loved her obsession with the wolves. She's always felt that this one particular wolf has been watching her, and has always longed to get closer to him. It's been compared to Twilight and I have to say, I think it is tonnes better! It honestly is. I like that it's written from different perspectives. It's good to see things from different peoples eyes than just one - you get to see and feel more. The story overall seems more fulfilling and leaves an impact on you once you've finished. Particularly near the end, you feel an intense range of emotions that has you racing to the finish to see what is going to happen next. I loved the use of the weather - I think it was an interesting and innovative way of having the werewolves change. And I'm glad that there were no magical powers. They don't turn into half-wolf, half-man beasts, or develop super strength. They are the real deal. Wolves. Simply wolves. Maggie Stiefvater has created something incredibly beautiful and I cannot wait to read the second book, Linger. Luckily I have a copy sitting right next to me! I don't think I can stress enough how good this book is - and how much I have thoroughly enjoyed it! And the design work inside is incredible. The title pages featuring the trees is very effective, and very cool! Kudos to Scholastic on that one! Thank you to Steven at Scholastic for my copy! This is a well written, wonderful, riveting tale with words that flow right off the page. Each line devoured keeps you hungry till the satisfying end.